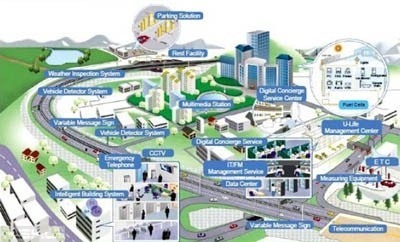 HCM City – The smart city operation centre, which is part of a larger smart city project launched a year ago, is expected to open at the headquarters of the HCM City People’s Committee. Last year, the city approved the project and plan to share and develop a database, create a data ecosystem, and open a smart city operation centre, an information security centre, and a socio-economic development strategy simulation and forecast centre. Quang Trung Software City was asked by the city to develop an execution plan to open the data ecosystem. In the first stage, funds from State budget and society will be used, and in the next stage, fees would be considered. The People’s Committee has instructed the Department of Information and Communications, in co-operation with Planning and Investment and Taxation departments, to integrate enterprises’ data with taxation data. The switchboard number 1022, which receives information related to infrastructure and technical incidents, will begin to also accept and provide answers to questions from local residents and enterprises. The smart city operation centre will be connected to the camera system already installed at the city People’s Committee, departments, industries and various centres. Also this month, the first stage of the shared and developed database will come into operation at Quang Trung Software City, and contain all information from departments and industries. In the second quarter, a bid will be organised to choose an investor for the completion of the shared and developed database. In a related matter, authorities are currently working to combine the three emergency phone numbers 113 (for police), 114 (for fire fighters) and 115 (for ambulance) into one number.